Description Aprotinin is the small protein bovine pancreatic trypsin inhibitor (BPTI). 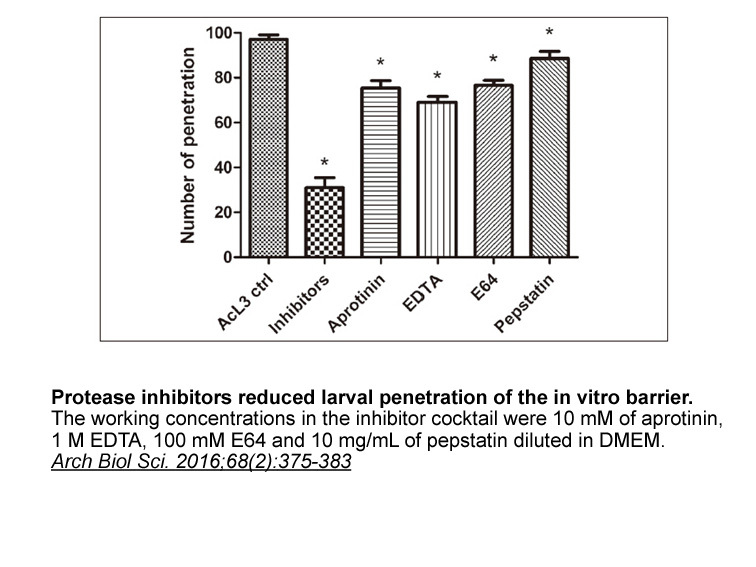 Aprotinin dose-dependently inhibited the TNF-α–induced expression of ICAM-1 and VCAM-1, but not E-selectin. The rats were anesthetized by 50 mg/kg of ketamine initially and treated with 12 mmHg pneumoperitoneum for 4h. Additional lower doses of ketamine were administered i.p. until the end of pneumoperitoneum to maintain anesthesia. A loading aprotinin dose of 28000 KIU/kg was given i.p. after the onset of pneumoperitoneum, followed by lower maintenance doses (7500 KIU/kg), which were administered per hour until the termination. Splanchnic reperfusion period lasted 60 or 180 min. Treatment of aprotinin caused reduction of several cytokines and markers (TNF-α, IL-6, endothelin 1, C reactive protein, PAB and carbonyl proteins) of oxidative stress in all tissues (liver, small intestine, and lung) studied. Asimakopoulos G, Lidington E A, Mason J, et al. 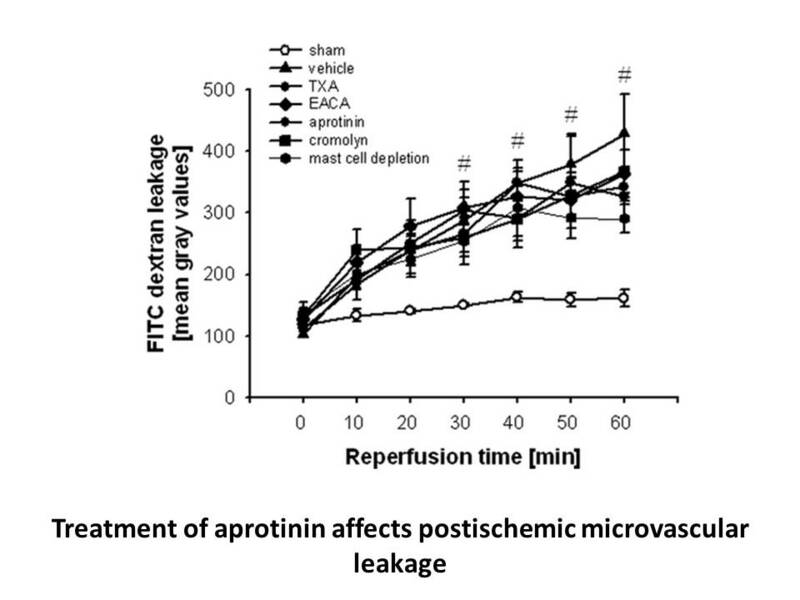 Effect of aprotinin on endothelial cell activation. The Journal of thoracic and cardiovascular surgery, 2001, 122(1): 123-128. Baltatzis M, Pavlidis T E, Ouroumidis O, et al. Aprotinin reduces oxidative stress induced by pneumoperitoneum in rats. Journal of Surgical Research, 2014, 189(2): 238-248. 1. 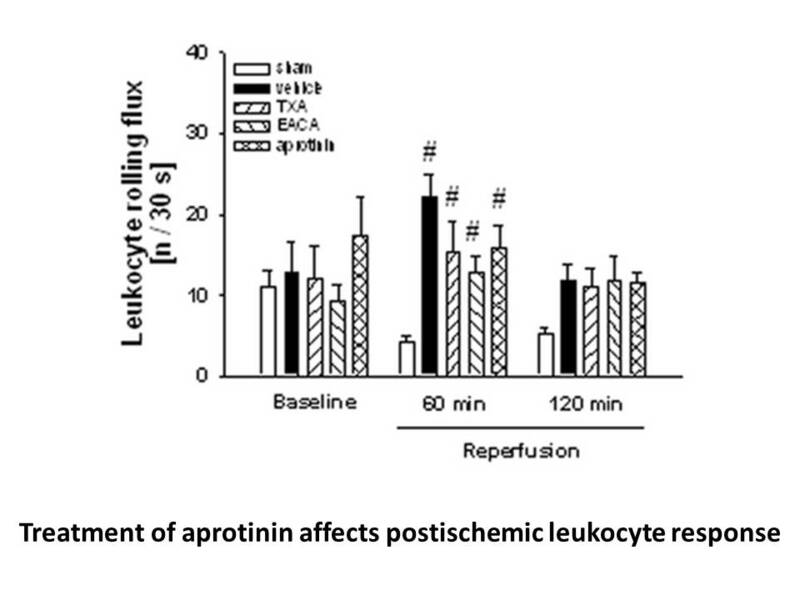 Replacement of aprotinin by ε-aminocaproic acid in infants undergoing cardiac surgery: consequences for blood loss and outcome. Br J Anaesth. 2013 Apr;110(4):615-21. doi: 10.1093/bja/aes430. Epub 2012 Dec 4. Aprotinin and EACA were evaluated for blood-sparing efficacy and other major clinical outcome criteria in infants undergoing cardiac surgery. 2. Retrospective cohort analysis of a single dose of aprotinin use in children undergoing cardiac surgery: a single-center experience. Paediatr Anaesth. 2013 Mar;23(3):242-9. doi: 10.1111/pan.12079. Epub 2012 Nov 27. The associations of aprotinin and red blood cells transfusion, renal injury and mortality in pediatric with cardiac surgery were assessed. 3. Aprotinin reduces the procalcitonin rise associated with complex cardiac surgery and cardiopulmonary bypass. Physiol Res. 2013;62(1):27-33. Epub 2012 Nov 22. Aprotinin reduced PCT level as well as levels of a few inflammatory cytokines, including TNFalpha, IL-1beta, IL-6 and IL-8, in post-PEA patients, in which PCT was significantly correlated with IL-6. 4. The risks associated with aprotinin use: a retrospective study of cardiac cases in Nova Scotia. Can J Anaesth. 2013 Jan;60(1):16-23. doi: 10.1007/s12630-012-9806-5. Epub 2012 Nov 7. Aprotinin may cause adverse effects, including increased risk of mortality and morbidity, during cardiac surgery. 5. Putting the record straight on aprotinin as safe and effective: results from a mixed treatment meta-analysis of trials of aprotinin. J Thorac Cardiovasc Surg. 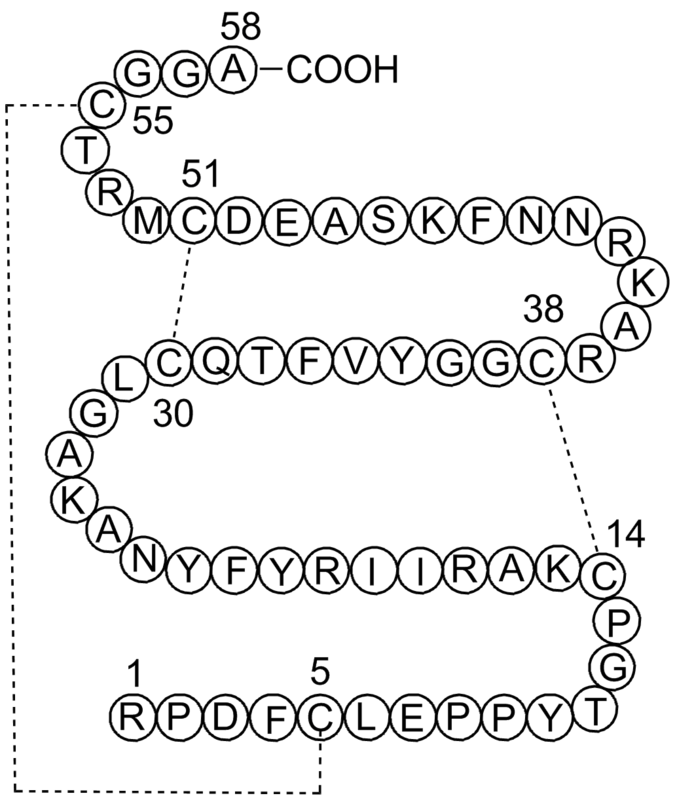 2013 Jan;145(1):234-40. doi: 10.1016/j.jtcvs.2012.07.018. Epub 2012 Aug 11. A new meta-analysis was conducted to assess safety and efficacy of aprotinin in cardiac surgery. Aprotinin, a naturally occurring serine protease inhibitor, saves lives and decreases the risk of stroke and repeat surgery for massive bleeding1, 2, 3. The use of aprotinin did not significantly increase the risk of renal failure or the need for postoperative renal replacement despite an increase in the proportion of patients who had a doubling of serum creatinine levels. The adjudication of death did not identify renal failure as contributing to or causing death associated with aprotinin use. A Meta analysis by Brown and colleagues showed a nonsignificant relative risk of renal failure with high-dose aprotinin4. Although aprotinin is potentially more effective than other active agents in controlling hemostasis, we noted only a possible trend suggesting that it decreased massive bleeding. Only repeat surgeries and important blood losses through chest tubes, one of the main indications for surgery, were potentially improved by the use of aprotinin. Aprotinin did not appear to prevent massive bleeding or save the life of patients who had massive bleeding. The adverse effects on mortality associated with aprotinin may also have been present among healthier patients, those under the age of 65 years, and those without coexisting illnesses at the time of surgery. Despite the possibility of a modest reduction in the risk of massive bleeding, the strong and consistent negative mortality trend associated with aprotinin as compared with lysine analogues precludes its use in patients undergoing high-risk cardiac surgery5. 1. Henry DA, Carless PA, Moxey AJ, et al. Anti-fibrinolytic use for minimising perioperative allogeneic blood transfusion. Cochrane Database Syst Rev 2007;4:CD001886. 2. Levi M, Cromheecke ME, de Jonge E, et al. Pharmacological strategies to decrease excessive blood loss in cardiac surgery: a meta-analysis of clinically relevant endpoints. Lancet 1999;354:1940-7. 3. Sedrakyan A, Treasure T, Elefteriades JA. Effect of aprotinin on clinical outcomes in coronary artery bypass graft surgery: a systematic review and meta-analysis of randomized clinical trials. J Thorac Cardiovasc Surg 2004;128:442-8. 4. Brown JR, Birkmeyer NJ, O’Connor GT. Meta-analysis comparing the effectiveness and adverse outcomes of antifibrinolytic agents in cardiac surgery. Circulation 2007;115:2801-13.